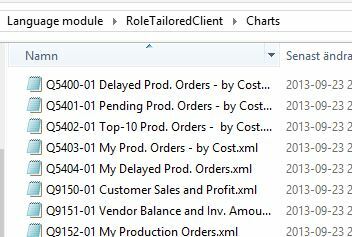 If you have downloaded a language module to 2013 or 2013 R2 you will have a folder containing all the charts in that language. The problem is that in standard Dynamics NAV you can only import them one by one plus that the function is real crappy! But don’t worry, I’m going to give you the code to import all of them at the same time. The principle behind this code is to filter out the files in the folder. For each file, upload it to the server, extract the ID and the name from the filename. Create a new record, create a outstream to the file and instream to the blob in the record. Copy the outstream to the instream. Here is the entire code in Dynamics NAV 2013 R2 text format. Copy and paste into a text file and import. You have probably ended up here because you want to export all charts but the standard NAV functionality only lets you export them one by one ( Generic Charts on msdn). Maybe you currently are upgrading a customer database from a pre Dynamics NAV RTC version and now you want to add the charts to the current database. Or you have a database with a different language base and want to export/import the charts from another database with a different language. Anyway, see code below. I have created a codeunit that exports all charts by iterating trough all charts, checking if the current record has a blob value. If it has a value create a stream that streams the data to a local temp file on the server, then download the file from server to the specified folder on the client. Finally, delete the server file. Here you can find the entire code in 2013 R2 format. Just copy and paste into a text file. Save and import. Beware, you need a developer license to import the object and after that you need to make sure or rename so the object is within the customer’s license. Once done you will probably want to import all the charts to the target database. Here you can read about importing all Dynamics NAV charts.